Images of the late rapper The Notorious B.I.G. 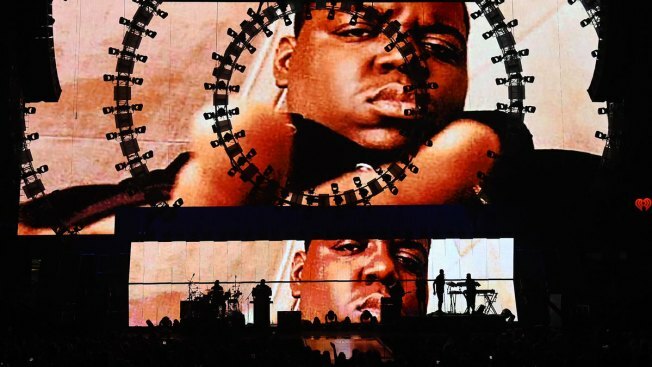 are shown during a performance by recording artist Sean "Puff Daddy" Combs at the 2015 iHeartRadio Music Festival . The late rap icon will be honored at the ASCAP Rhythm & Soul Awards later this month. The late rap icon Notorious B.I.G. will be honored at the ASCAP Rhythm & Soul Awards later this month. The performing rights organization said Thursday that the rapper will receive its ASCAP Founders Award on June 22 at The Beverly Wilshire Hotel in Los Angeles. It will be its 30th annual Rhythm & Soul Music Awards. The Notorious B.I.G, born Christopher Wallace in New York City, was shot to death in 1997. His mother, Voletta Wallace, his children, and his widow, R&B singer Faith Evans, will accept the award on his behalf. The hip-hop legend was a powerhouse success in the '90s with albums like "Ready to Die" and "Life After Death." His hits include anthems like "Juicy," ''Big Poppa," ''Stay With Me," ''Hypnotize" and "Mo Money Mo Problems." "Biggie was a legend in his own time and his legacy lives on through his music," said ASCAP President Paul Williams. "Like all songwriters, he was a master storyteller, but it was the realism in his rhymes that captured so many." Last month Evans released a collaborative album with Notorious B.I.G called "The King and I." Jimmy Jam & Terry Lewis will also be honored at the ASCAP event with the Voice of Music Award. The Grammy-winning songwriting duo, who will be inducted into the Songwriters Hall of Fame this month, mostly notably have worked with Janet Jackson throughout her career. They have also crafted No. 1 hits for George Michael, Usher, Mariah Carey and Boyz II Men. Past ASCAP Founders Award recipients include Quincy Jones, Stevie Wonder, Carly Simon, Patti Smith and Paul McCartney.